Many of us hear routinely from those who say they simply don’t know what they should be eating. When you’re exposed to a barrage of conflicting views from different ‘experts’, authorities and organisations, it’s no surprise if you feel confused and more inclined to put your head in the sand. In this maze of conflicting information, many people are then more likely to revert to eating according to government guidelines. But it’s this very advice, including the recommendation to depend on starchy carbohydrates as our main energy source while reducing fat intake, that’s contributing to the rapid spiral in chronic diseases. That includes obesity, type 2 diabetes, coronary heart disease and even some forms of cancer, now the main killer diseases in most societies. Government guidelines are based on outdated or flawed science. That's where our Food4Health guidelines come in. Informed by the latest developments in nutritional science, and the experience of clinicians and citizens all over the world, we provide you with advice, guidance and information, that can help you, your family and your friends, eat in ways that have the capacity to optimise your health. Help you to reduce or eliminate your dependency on pharmaceutical drugs as the primary means of healthcare. Our adult and children Food4Health guidelines, updated in May 2018, provide advice on how we might combine foods in a way that delivers the nutrients required to support not only our energy needs, but also the 135 or so metabolic pathways and 12 body systems. The approach we adopt in our guidelines is about using the most relevant and emerging science that can be helpful in avoiding the metabolic conditions, imbalanced gut microbiome and persistent low-grade inflammation that underpin the chronic diseases that now run rampant in society. Our “Carb Junkie vs metabolically flexible, fat-adapted and resilient human” poster has been designed to help you make better use of the 4 energy pathways available to your body to help you develop metabolic flexibility and resilience – keys, of course, to long-term health and wellness. 30 Jan 2019 Is your diet packing enough protein power? 11 Jul 2018 Food4Kids guidelines updated! 07 Mar 2018 ANH-Intl Feature: Are governments deliberately on the wrong anti obesity track? 25 Feb 2015 Milk - the good, the bad and the not for everyone! Alongside the spread of agri-business, our food supply is now largely in the grip of the large corporations. With the increase in food processing and the growth of supermarket control of food marketing, has come a large decline in the quality and nutrient value of our global food supply. The increasing reliance of food producers on artificial fertilizers, herbicides and pesticides is benefiting the major chemical industries, but is undermining our health and damaging vital eco-systems on which we all depend for our survival. These trends are being reinforced by international guidelines on food and food supplements, developed through the Codex Alimentarius Commission, which will have world-wide impact. Chronic illnesses and degenerative conditions have reached epidemic proportions. However, the majority can be successfully mediated by diet and lifestyle changes. Governments and policy makers are doing little to turn the tide on our modern, unhealthy, de-natured diet and lifestyle choices. Treatments are almost solely focused on the use of medication – to the benefit of Big Pharma and the detriment of most others. Over the last 50 years the levels of key minerals within fruits and vegetables in the UK alone, have declined by up to 70%. We need to re-examine our relationship both to food and the natural world in order to reclaim our health and the earth that we depend on. Over the last half century we have seen an unprecedented shift in the farming systems that produce the majority of our food. The majority of us are now dependent on massive, agri-business farming systems, which are in turn dependent on seeds, pesticides and machinery—all of which are controlled and supplied by some of the largest corporations the world has yet seen. Our diets have become over simplified and largely grain-based, which apart from the lack of nutritional diversity, is causing an unprecedented impact on our health. Food has become a global commodity and is now subject to international guidelines developed through the Codex Alimentarius Commission. These guidelines favour the international trade of processed, low quality foods by transnational corporations. These foods are a very significant contributor to the increasing rates of degenerative disease, from cancer to heart disease, and diabetes to obesity. This is a stark contrast from the small-holder systems that relied on locally-produced seed to provide wholesome wholefoods—the system that met the subsistence needs of our ancestors for the vast majority of the 10,000 years since agriculture was first recorded. Filmmaker Marie-Monique Robin’s documentary, released in France in March 2008 and still very relevant, called “The World According to Monsanto” details the troubling past of one of the world’s biggest agrochemical and seed companies, Monsanto—a company that appears to be controlling our food supply to a greater extent than any other single entity on the earth today. Based on a painstaking investigation, this documentary pieces together the story of Monsanto, a century-old corporation with a controversial past and today’s leader in genetically modified crops. Monsanto claims it wants to solve world hunger and protect the environment, but its quest for market supremacy is to the detriment of global food security and environmental stability. Given that it is now recognised by all health authorities around the world that diet and lifestyle are the primary factors in all major chronic diseases, it beggar’s belief that the medical establishment still remains relatively uneducated and uninformed on this subject and continues to peddle drugs as the primary treatment regimen. The Food4Health campaign aims to stimulate greater emphasis on the use of foods and other lifestyle approaches for preventative healthcare, rather than exerting the effort and the money on an already diseased and toxin-laden body. If there’s one thing all the health statistics agree on—this is not sustainable. We live in an era where chronic diseases like coronary heart disease (CVD), cancer, diabetes and obesity, are storming ahead as the leading causes of premature death. The key feature of all these diseases is that they have an incontrovertible relationship to diet and lifestyle. This means that lifestyle risk factors such as diet, nutrition, exercise, stress levels, alcohol consumption and smoking have a powerful influence on the health of a nation. And little to nothing is being done to educate people about healthy eating and lifestyle choices. Despite what we are constantly being told, we may be living longer in statistical terms, but our morbidity rates (the rates at which we are living with illness) are increasing dramatically. Interestingly, these statistics don’t make it into the mainstream press as readily as the so-called survival rates! Depending on exactly which figures you are looking at, and which countries they emanate from, there is a suggestion that we may have reached a point where we are already starting to see a decline in life expectancy in countries like the UK and USA. For a list of countries with decreasing expectancy click here and for a list of countries showing the number of morbidity free years click here. Over the last 50 years the levels of key minerals within fruits and vegetables in the UK alone, have declined by up to 70%. Whilst dietary surveys show that large sectors of the population are deficient in particular vitamins—e.g. C, D, K—or minerals—e.g. selenium, zinc, magnesium—despite the growth of the organic fruit and vegetable sectors, and the increased availability of ‘fresh’ fruits and vegetables. The harsh reality is that even an apparently ‘balanced diet’ today will often leave you deficient in particular nutrients and your immune system less than fully primed to handle both toxic and microbiological assaults. Worse still, the typical children’s diet is so bad in the western world, that unless we see profound changes over the next few years, we can expect to see an explosion of cancer, CHD and other degenerative diseases unlike anything we have experienced to date. Get down on our knees and make contact with that stuff we call earth! Think about growing some of your own food or herbs—even if you live in a 10th floor apartment, it’s remarkable what you can grow in pots on the window ledge! Understand it’s not all about our bodies – if our minds are not at peace we can never be truly healthy. Take some ‘me-time’, laugh more, do what you love and love what you do. The disassociation from nature and our natural roots has to come to an abrupt end if we are to reclaim our health and have an influence on the future health of our nations. That’s why you have to tell people about the Food4Health campaign! Do you want your kids to have food—or drugs? See the trailer of Kevin Miller’s stunning documentary Generation RX below—and decide for yourself. Some people have difficulty complying with very detailed and specific dietary recommendations. As a result, we have developed looser guidelines that provide more general indications for diet and lifestyle, that are informed by the latest scientific views. Consume at least seven portions of fresh fruit and vegetables (which equates to roughly 400 to 600 g) a day, every day. This recommendation derives from guidelines to consumers developed by the United States National Cancer Institute and American Institute for Cancer Research which stipulate five to nine servings per day. Fruit and vegetables contain beneficial fibre, phytonutrients, antioxidants, vitamins and minerals, and eating a good amount (whilst at the same time ensuring that protein intake is not too high) can also help ensure net metabolic alkalinity, which is important for maintaining bone strength, and preventing osteoporosis. Focus on selecting diverse types of fruit and vegetables—don’t always have the same types. Diversity is very important to ensure you get a good mix of different types of nutrients. Broccoli is an extremely healthy vegetable, but don’t only eat broccoli every day, to the exclusion of other vegetables. Remember to ‘eat a rainbow’ everyday. Focus on mixing lots of different colours too: dark greens, oranges, reds, light greens, yellows, and so on. These natural colours are actually comprised of different nutrients, many of which have cancer protective properties. Red foods contain lycopene (a carotenoid), which is associated with a reduction in cancer risk, especially prostate cancer. Yellow and orange foods also contain different blends of powerful natural carotenoids, a group of some 400-500 naturally-occurring substances with cancer-fighting properties. Green foods like broccoli, kale and Brussels sprouts contain glucosinolates, which are associated with decreased cancer risk. White-green foods, such as garlic and onions, contain allyl sulphides that also appear to be important to your anticancer armoury. Finally, purple and dark blue berries contain highly beneficial anthocyanins. Eat home-prepared food as often as you can and don’t overcook or over-steam your vegetables and certainly don’t microwave them. This type of cooking breaks down a lot of the enzymes and other nutrients. It also damages the ‘life energy’ within the food. There has been some concern recently about consumption of high levels of the natural fruit sugars (fructose) contained in fruit, and increased risk of diabetes. This concern is of course a valid one, though the risks are generally associated more with fruit juices, particularly concentrates, and fructose-based sweeteners such as high fructose corn syrups. The inclusion of a few portions of fruit as part of a well balanced diet is not associated with risk of either diabetes or obesity, especially if you choose fruits with a low glycaemic load. Glycaemic load refers to the amount that a food will raise your blood sugar after you’ve eaten it. The conclusions of researchers in the article: ‘How safe is fructose for persons with or without diabetes?’ (American Journal of Clinical Nutrition) is that obesity and diabetes rates were low when total fructose intake was in the range of 25 – 40 g/d. As a guide, a medium sized apple has around 6 g of fructose if you eat the skin, whereas 3 dates contain around 31 g. Choosing your fruits carefully is important as the body has no satiety system for fructose. This means your body won’t signal you when you’ve eaten too much. Fructose metabolism is also very heavy work for the liver and uses a lot of energy. All in all, whether you’re at risk of getting diabetes or not, more than 25-40 g/d of fructose is not good for your body. Fruits that are lower in sugar are those such as, apples, avocados, tomatoes, lemons, limes, rhubarb, blackberries, raspberries and cranberries. 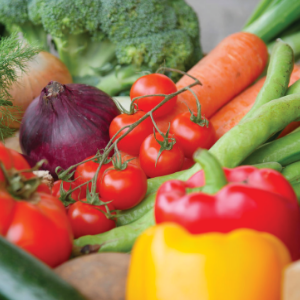 Whilst some vegetables can be fairly high in sugar, such as corn, carrots, beets, peas, plantains, winter squashes and parsnips and should therefore be limited. Consume complex, rather than simple, carbohydrates. Use a Glycaemic Index (GI) or better still, a Glycaemic Load (GL) chart and select moderate to low glycaemic ‘carbs’ whenever you can. Don’t consume white bread, go for whole grain and seed breads. Once grains are refined, they’ve lost up to 80% of their vitamin and mineral content. Click here for GL values of food types. Grains are a relative newcomer to the human diet, and wheat and other gluten containing grains are problematic to many. However, agriculture has been around since approximately 8000 BC, and the most nutritious whole forms of grain, such as quinoa, are in a different league from the highly processed junk foods foisted on us by the big food corporations. Whole, minimally processed, organic, gluten-free forms of grain can be enjoyed as part of a healthy nutritious diet, although ideally these would be varied, and should not dominate the diet. Aim for around 15% of your plate for grains and remember that even though these are complex carbohydrates, they are starchy carbs and still end up contributing to an overall increase in blood sugar. Independent nutrition experts today would not routinely recommend dietary restrictions in complex carbohydrates, which would therefore restrict intake of vegetables and fruits. Such restrictions became popular in the late 1990s/ early 2000s, with the arrival of the controversial Atkins diet. Vegetables and fruit, according to S. Boyd Eaton, M.D., one of the foremost authorities on paleolithic (prehistoric) diets, are believed to have accounted for approximately 50% of the hunter-gatherers diet, and probably included a wide variety of fruits, roots, legumes, seeds and other non-cereal plants. Such wholefoods, particularly the vegetable and fruit forms which are lower in sugar, should perhaps ideally form the main part of the diet today, also. They are crucial for their fibre, high potassium, alkaline promoting properties, anti-inflammatory effects as well as for the important and diverse health-giving properties of their phytonutrient constituents. There is increasing evidence that high cholesterol is not actually the ‘guilty party’ in heart and artery disease, but that it just happens to be found ‘at the scene of the crime’. Both high homocysteine and inflammation of the arteries are being increasingly considered the true culprits. Therefore, reducing inflammation by avoiding refined foods, increasing fruit and vegetables as well as avoiding an excess of saturated fat and trans fats, and successfully balancing omega 6 and omega 3 fats could more important than ever. Reducing inflammation in this way may also protect against other chronic diseases, including cancer and arthritis. This is also the reason we do not encourage consumption of dairy fats, although eggs are indeed a good nutrient source. Although our hunter-gatherer predecessors are very likely to have eaten all of the fat and the lean meat of the wild animals they killed, these too are a far cry from the ‘artificially’ fattened up domestic farm animals of today. Today’s supermarket meat fat perhaps represents the undesirable and cruel profit-driven motives of our meat and food industries. Wild animals eat a more natural diet that ensures that their meat is higher in omega 3 fats, whilst no-one can really be sure about what was in diets of the farm animal’s served up for us today. One thing we do know is that approx 85% of compounded animal feed currently used in Europe consists of genetically modified grains. Choose organic and grass fed meat, poultry and dairy options wherever possible. Finally, it is known that dioxins and other contaminants such as PCBs accumulate in animal fat. These are products of the chlorination and other industries, the incineration of waste, and the widespread use of herbicides. Fats are good for you, as long as they are the right type. They should especially come from plants (notably nuts and seeds) and fish, rather than from farm animals. They should also not be processed. The monounsaturated fats, like extra virgin olive oil, and the polyunsaturated omega-3 oils (the best sources of which are open water, non-polluted oily fish and flax seeds) are well known to be very good for you. Don’t scrimp on these healthy fats, they are a wonderful energy source and contain nutrients, like essential fatty acids, that are very good for you. Omega-6 polyunsaturated oils (found in nuts and seeds, sometimes along with smaller amounts of omega-3 oils) are also beneficial (provided that the nuts and seeds are not stale or rancid), but should not dominate the diet. Evidence points to a low ‘ideal ratio’ of omega-6 to omega-3 fats. It is likely to be between about 1:1 to 4:1. The ratio tends to be over 15:1 in the typical Western diet, and this appears to promote inflammation and chronic disease. This is because omega-6 fats, which are more commonly available in foods than omega-3 oils, are actually able to imbalance fatty acid metabolism and disturb the pathways needed to dampen down inflammation. Inflammation in the body is associated with all chronic diseases as well as conditions like arthritis, depression, psoriasis, and blood clots. Polyunsaturated oils should be used in salad dressings etc, and should not be heated. Once they reach a certain temperature, their numerous ‘double bonds’ become mis-shapen or ‘trans’. Trans fats are harmful fat molecules, unable to serve any useful purpose in the body. They can damage health, are associated with breast cancer, can promote inflammation and are banned from food products in some countries. Monounsaturated fats such as olive oil, though still damaged by high temperatures, are a safer option, as they contain only one ‘double bond’ on each molecule that may become ‘trans’. Trans fats (and hydrogenated fats – also proinflammatory) are typically found in many processed foods, fries, and bakery products, pies and confectionery. Try also to avoid pro-inflammatory saturated fats in cheap and processed meats. Medium chain triglycerides (which occur in high amounts in coconut oil) are also, of course, another very important group of health-promoting fats. They are valuable as an easily digested and absorbed, and metabolically stimulating energy source, but are not associated with insulin production or the laying down of more than very small amounts of body fat. Coconut oil is great for cooking. Finally, phospholipids are another type of fat compound, and a major component of cell membranes and myelin sheaths surrounding nerve cells. Soy lecithin is a useful source of the phospholipids, phosphatidylcholine and phosphotidylserine, although these differ slightly from those found in animal sources. Despite this, lecithin has various health benefits, including those of memory and brain function. Lecithin can be usefully sprinkled on various foods such as salads. Fat soluble vitamins may be obtained from fish and fish oils, eggs, and to a certain extent from the fat traces in lean meat. Consume as much organic and farm-fresh food as your budget will allow. When it comes to prioritising, ensure that whenever you are dealing with fatty foods, such as meats and dairy—as well as salad vegetables and fruits, go for organic. This helps to reduce your chemical load. Another benefit of certified organic foods is that crops must be grown in the soil, so you get uptake of trace and ultra-trace minerals. Many people don’t realise that a large amount of the non-organic salad produce bought in supermarkets is grown hydroponically in water containing a very limited range of nutrients. Such crops, for example tomatoes, peppers (capsicums) and cucumbers, won’t have ever touched soil! Take high quality supplements to fill the nutritional gap between your foods and the levels and types of nutrients required for optimum health. The micronutrients that most people are low in include specific vitamins, minerals and plant nutrients, as well as Omega-3 fatty acids, as found in oily, cold water fish and high quality fish oil or plant-based oil supplements. When taking vitamins and minerals, try to, as far as possible, rely on food-form vitamins and minerals as these are in the same form to the nutrients in natural foods to which are bodies are adapted. High dosages of nutrients, best taken under the direction of a qualified nutritional or functional medicine therapist, can be very helpful to restore normal physiological functions and good health. High dose nutritional therapy is however heavily under attack by regulators, especially in Europe, but increasingly this is a worrying global trend. Renowned medical doctor and nutritionist, Dr Emanuel Cheraskin, of Alabama University Medical School, proposed Suggested Optimal Nutritional Allowances (SONAs) in place of Recommended Daily Allowances (RDAs) as early as the 1980s. Along with his colleague, WM Ringsdorf, Cheraskin also found decades ago that nutritional requirements increase substantially as we age (e.g. Cheraskin and Ringsdorf, Risk Factors in the Aging Process, The Journal of the Royal Society for the Promotion of Health, 1973; 93: 302-304). Is it any surprise that the over-50s are some of the most enthusiastic consumers of vitamins? For further information on the scientific case for supplementation, download an article by Dr Robert Verkerk entitled the ‘The case for nutritional supplementation’. We produced these guidelines as part of ANH-Intl’s contribution to the ‘You and your family: Your pregnancy guide‘ Winter/Spring 2010 publication that was produced in association with the Royal College of Obstetricians and Gynaecologists. Generally, the ‘Dietary Guidelines for Better Health’ also apply to pregnancy and lactation, but there are also some further key points and guidelines to keep in mind. The good news is that when pregnant, the body becomes more efficient at absorbing nutrients. Nevertheless, it is vitally important to prevent any nutrient deficiencies, and to eat a nutritionally rich, balanced and varied diet, as well as to ensure sufficient intake of clean, uncontaminated (and non-fluoridated) water. Nutritional preparations for pregnancy should begin at least several months before conception, if possible. A deficiency of folate is well known to be associated with increased risk of neural tube defects (such as spina bifida) in the first month of pregnancy. Leafy green vegetables, oranges, asparagus, beans and peas are all natural sources of folate, and these are the ideal source for a developing baby. However, most GPs recommend 400 micrograms daily of folic acid for women of childbearing age, with higher levels for women at particular risk of giving birth to an infant with neural tube defects. Folic acid is however a synthetic supplement, but it has become an important means of ensuring that babies are not born with such defects. There are apparent dangers with consuming too much synthetic folic acid, and it appears that the risks increase with age. Leafy greens do not tend to be the most popular food group in the diet, so supplementation is often needed. It is best to try to consume 1-1.5 mg of folate in the forms in which it naturally occurs in green leaved vegetables (5-methyltetrahydrofolate (5-MTHF) or calcium-L-methylfolate and folinic acid), although such supplements are harder to find and may be only available through a clinical nutritionist or nutritional therapist. Failing this, taking a supplement which delivers 400 mcg daily of folic acid will do. Folates are important before, throughout pregnancy, and during lactation, as are all the B vitamins. Fish oils contain the important Omega 3 fatty acids, docosahexaenoic acid (DHA) and eicosapentaenoic acid (EPA), essential for a baby’s brain and motor development. Sufficient sources are therefore important not only in pregnancy, but also during lactation. However, it is recommended that pregnant women, and those women and girls who plan to become pregnant in the future, do not consume more than 2 portions (portion = 140g) of oily fish (e.g. salmon, mackerel, swordfish, trout) per week. This is because these varieties may contain low levels of pollutants such as dioxins and polychlorinated biphenyls (PCBs). These may build up in the body over time. Swordfish and tuna (including canned tuna) may also contain high levels of mercury, and these types of fish may therefore need to be limited to one portion per week. It may be helpful to eat smaller species of fish, such as sardines, since these fish will tend to contain lower levels of pollutants. Decontaminated fish oil supplements are a popular alternative source, although higher than recommended daily amounts are likely to thin the blood and interfere with blood clotting. Cod liver oil is not suitable because of the high levels of vitamin A (retinol) that it contains. High levels of vitamin A have been found to increase the risk of developmental defects. Flaxseed oil is a vegetarian source of alpha-linoleic acid (ALA), from which the body can make its own DHA and EPA, although this metabolic process may be inefficient in some people. It’s always best to take omega 3 fish oils to ensure sufficient intake of EPA and DHA. Keep blood sugar levels ‘in balance’ by choosing complex carbohydrates (e.g. unprocessed, whole vegetables and fruit, brown rice, brown flour, unrefined carbohydrates such as oats and whole grains), rather than refined (white) carbs, sugary foods and high fructose drinks. Combine carbohydrate intake with a little protein, and eat little and often, rather than leave long gaps between large meals. Benefits of balancing blood sugar may include: reduced risk of nausea and morning sickness, reduced risk of constipation and high blood pressure / pre eclampsia, a more efficient immune system, and reduced risk of excessive weight gain. Calcium is required for the development of the baby’s bones and teeth, and is particularly important during the third trimester. Recent research indicates that, by and large, there is no additional dietary calcium requirement for pregnant women, since intestinal calcium absorption normally increases during pregnancy sufficiently to provide all the baby’s calcium needs. Vitamin D assists with calcium absorption, but has many other very important beneficial effects for mother and baby, including, as shown in a very recent US study, the prevention of preterm labour/births and infections. However, this vitamin is often deficient as a result of inadequate exposure of the skin to sunlight. Existing RDAs for vitamin D (5 mcg/day = 200 IU) are woefully inadequate for those not regularly exposed to sunlight. Leading vitamin D researchers such as Dr Bruce Hollis and Dr Reihold Vieth advocate at least 100 mcg (4,000 IU) daily. The researchers of the above-mentioned US study, led by Carol L. Wagner MD, also recommend 4,000 IU per day for all pregnant women. A 2004 review by Hollis and Wagner (Division of Neonatology, Department of Pediatrics, Medical University of South Carolina, Charleston) on the vitamin D requirements during pregnancy and lactation put this into context. During lactation, there is a normal loss of maternal bone mineral density, but this is restored after weaning, once again apparently independently of calcium and vitamin D status. For those who choose not to eat dairy, good sources of calcium include: nuts (especially almonds), green vegetables such as brocoli, curly kale, okra, watercress, spinach, died apricots and figs, oily fish, pulses, sesame seeds, and tofu. The mineral magnesium is involved in over 300 basic processes or functions within the body. It is vital in the formation of bone and of proteins, for cell replication, and in energy production. This means it is essential during pregnancy. It is crucial for protecting the developing brain, particularly for those at risk from preterm birth. Magnesium is essential for the relaxation of muscle, which means that it also plays a crucial part in regulating blood pressure, blood flow, and heart function. Low magnesium levels are a recognised marker in the prevention of premature labour, and it appears that this is due to the mineral’s relaxing effect on the womb, and its ability to inhibit early contractions. Deficiency of this essential mineral is rampant. Results from year 1 (2008/2009) of the UK National Diet and Nutrition Survey (NDNS) Rolling Program give the mean intake for women of childbearing age as 189mg (the RDA is 350mg). More worryingly, 46% of 11-18 year old females consume a diet which delivers magnesium below the Lower Reference Nutrient Intake (LRNI: the amount sufficient for only about 2.5% of that particular group). Foods rich in magnesium include: green leafy vegetables, nuts and seeds, whole grains, fish and meat, beans and artichokes. The need for iron tends to increase during the third trimester, when the foetus is building up its iron stores, and due to the increased maternal blood volume. It is at this time that maternal anaemia may develop, and a ferrous (iron) sulphate supplement is then likely to be recommended by a doctor. This form of iron is often associated with constipation, a condition which is better avoided during pregnancy. Ferrous bisglycinate is an effective and gentle alternative form of iron, which is just as effective at approximately one tenth of the dose recommended for ferrous sulphate, and generally tends to be free of side effects. Iron supplements, other than plant-derived liquid ones specifically intended for pregnancy, should not generally be used in pregnancy unless an iron deficiency is found to be developing or present. It may, however, be a good idea to include good sources of iron in the diet during pregnancy and lactation, and to ensure that plenty of vitamin C is also available. Not only will vitamin C assist in the absorption of iron from the diet, but it will also protect the maternal circulatory system and ensure tissue integrity. Good sources of iron include: dark leafy greens, legumes, dried fruits, wholegrains, pulses, legumes, meat and fish. Good quality plant-sourced iron supplements can also be bought from most health stores. It is important to avoid the following foods during pregnancy: soft and blue cheese (may contain listeria or other harmful microorganisms), green potatoes (contains toxic solanine), liver (contains excess vitamin A), shellfish, raw fish (may contain parasites), cured meats (contain nitrates and other preservatives), pate (may contain listeria or salmonella), unpasteurised milk (may contain a high load of bacteria), peanuts (contain lectins and aflatoxins, or may be associated with allergy in infants). Consume organic foods or those grown free from synthetic pesticides where possible. Specific substances best avoided include: most synthetic chemicals, lead, anaesthetics (if possible), laxatives, X-rays, cleaning products, paint, lacquers, petrol, aerosols, glue, pesticides, hair dyes, plastics, aluminium foil, saccharin, aspartame (Splenda®), food additives and preservatives, as well as, unless advised specifically by your health professional, over the counter medications. Statin drugs, for example, have been shown to be teratogenic i.e. they have been found to harm the developing foetus. It is important to avoid herbs and herbal products during pregnancy unless recommended by a qualified herbalist, or other experienced health practitioner. Some herbal products (advised for use by a qualified herbal practitioner) can be used very successfully and safely to treat mastitis while the baby continues breast feeding, so avoiding the use of antibiotics and the discontinuation of breastfeeding. Lemon or ginger tea may be helpful to alleviate nausea. There is any sign of bleeding associated with the pregnancy, pregnancy-induced high blood pressure or pregnancy-induced asthma is present, there is a history of previous miscarriage or a history of pre-term labour. Yoga may also be very beneficial, but there are certain positions which are not recommended during pregnancy (seek advice from a qualified instructor or reliable source). It is important to set aside regular times for relaxation, and to ensure adequate sleep. During lactation, there is an increased need by the mother, of calories, protein, vitamins and minerals. It is important during this time, to eat a full, varied and healthy diet, and to avoid rapid weight loss. Dairy do or dairy don't? 31 Jan 2019 Is your diet packing enough protein power? 09 Jan 2019 Exposé: Are you an unwitting pawn for profit? 03 Oct 2018 Wrongly accused - Dr Gary Fettke absolved of all charges! 27 Sep 2018 Worried that your herbs might be messing with your drugs? 01 Aug 2018 Top Tips for Summer joy! 06 Jun 2018 Are you courting autoimmune disease with your daily staple? 10 May 2018 Is depression a mental or physical condition? 02 May 2018 How to spot a sat fat dinosaur? 15 Mar 2018 Is type 2 diabetes really more likely if you go gluten free? 10 Jan 2018 Food provenance: where’s your food come from? 11 Oct 2017 Are you a food addict? 21 Jun 2017 For fats sake, don’t follow those guidelines! 15 Mar 2017 Is taxing our way out of obesity the answer? 15 Mar 2017 Is type 2 diabetes really more likely if you go gluten free? 07 Mar 2017 Is healthy eating really more expensive than junk food? 25 Jan 2017 What's the big deal about gluten? 12 Oct 2016 Irish Debate: Animals - do we need them in our diets? 04 May 2016 Can the Low Carb High Fat bubble be burst? 09 Dec 2015 Cooking ourselves to death? 25 Feb 2015 Milk – the good, the bad and the not for everyone! 18 Feb 2015 Cows’ milk – food of the Gods or driver of modern disease? 04 Nov 2014 Swedish study: could your dairy consumption weaken rather than strengthen your bones? 24 Sep 2014 Gender-bending xenoestrogens: If they’re a problem for fish, could they be a problem for you? 06 Aug 2014 Caution: UK non-diet soft drinks laced with artificial sweeteners! 12 May 2014 Is eating protein really as bad as smoking? 12 Feb 2014 ANH-Intl Feature: Does folic acid protect from – or cause – cancer? 12 Jun 2013 The simplest way to digestive bliss: chew your food properly! 20 Jun 2012 Stop press: prunes DO have a laxative effect, according to EFSA! 06 Jun 2012 ANH Feature: Are you one of the 60% eating yourself towards chronic disease? 09 May 2012 Let thy medicine be thy food and thy food be thy…opiate? 02 May 2012 Tax yourself fitter? 19 Apr 2012 Don’t believe all that you read! 26 Jan 2012 ANH FEATURE: Dieticians and nutritional therapists: never the twain shall meet? 06 Jan 2012 Government advice on nutrition: will it help you or make you sick? 27 May 2011 Marmite not banned in Denmark – just not specifically allowed! 09 Sep 2010 ANH Feature: What is ‘natural’? 18 Aug 2010 Would you like chips, tomato sauce and statins with your burger? 08 Apr 2010 ANH Feature: The Mediterranean Diet—Can It Help You Live Longer? 09 Mar 2010 Snake oil—or a breakthrough for bipolar disorder? 09 Sep 2009 Antioxidant content of fruit more than previously thought? Milk – the good, the bad and the not for everyone! Do the nutritional benefits of dairy outweigh the potential health risks linked to intolerance and autoimmune disease?